I knew this was going to happen and I could almost see the trend happening. With the advent of DVDs, each band is going out there and putting out a live product to capitalize on the success of a tour or just to keep a visual record. Let’s face it, if you are a die-hard fan, you will pick up any CD or DVD that your band puts out. This is Rush’s third bite at the “money” apple. 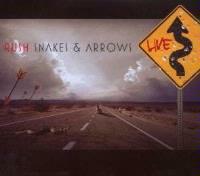 We got live albums from the Test For Echo and Vapor Trails tours (along with the CDs in the deluxe R30 package) so why not put out Snakes & Arrows Live. While the title is not very inventive, the music here is well worth the cost. Sure, many of the tracks have been covered elsewhere but again, we get a full show as it happened and they throw in enough older gems that makes it a must buy for any Rush fan. Even if these types of things smack of cash-in, Rush have always put out great music; whether it be studio or live. If you were at any of the concerts on the Snakes & Arrows tour, then this is a great audio tourbook from that event. There is a little bit of a false start on this one. If you watch the DVD, the guys are joking around; making it look like Lee and Peart were not ready yet. Other than that, it is a great opener with the band playing this very close to the Moving Pictures version. This overlooked gem is from Signals and it doesn’t sound out of place from the rest of the material. Lifeson puts in one of his best solos in this cut from 1982. The ending is a bit stretched out but other than that it is played like the original. It’s great to see them pull out older songs that really are not hits especially since they have a lot of songs from which to choose. Here we get another cut that has never managed to make it to one of their live albums. It’s a great track from Permanent Waves and it is played as if it was just written. There is an upbeat feel to it with "hit single" written all over it. It must not have made much of a mark back in 1980 and I don’t think it ever charted. All of that means nothing because they have brought it back into the setlist and the fans seem to respond favorably to it now. There is a little difference at the very end, but it sounds very much like the studio version. I like the Hold Your Fire album but this is one of the songs that sounds out of place. It has a very ‘80s sound and although it is not as “bright” as the studio version, it just does not have the same power as the other material here. This always seems to get a great crowd response and I am baffled as to why. Not that it isn’t a great tune because it is; it is just an unlikely hit. The years have not changed a note of this cut. It has that signature sound that Rush created in the early ‘80s. Lee even does a respectable job with the high vocal after the guitar solo. Since this is the Snakes & Arrows tour, we finally get a track from that CD. This instrumental carries over live very well. Since it is a newer tune, it is played very close to the album version. You can almost hear the renewed energy in the band as the song develops. I hope they leave this one in the set for a while. Peart weaves us another lyrical vision of the wide gap between the rich and poor on this Snakes & Arrows track. I didn’t know how some of the songs would carry over in a live setting but this song has no problems with that at all. It captures all of the subtle nuances of the studio version. Even though the Rush In Rio CD was showcasing the Vapor Trails material, I think this version has a little more fire to it. It may be the mix but here it has more contrasts and doesn’t have that grey sound where all the highs and lows get lost. Although Lee doesn’t hit the high notes of the original, they play manage to dust off this great oldie and give the older fans a trip down memory lane. I guess they swapped this one out with “The Trees” and I have no problem with that. It is a great version and one we hadn't gotten on any live album until now. Dirge like keyboards usher in this deep cut from Grace Under Pressure. Even though that was a very dark and depressing record, here it sounds more upbeat and definitely makes you want to rediscover the original. I like this version better because it has more of an organic sound as opposed to the sterile rendition on Grace Under Pressure. This was the last song of the first set and it is a great way to close things off before a bit of rest. There is a little bit of difference in the guitar solo section but aside from that part, it is pretty much spot on from the Roll The Bones track. Set two opens with a good chunk of Snakes & Arrows material. Here we get the first single and it is an energized version. It is a faster rocker that captures the Rush sound perfectly; especially after the raw and non-Rush sound of Vapor Trails music. The band has seemed to reconnect with what they do best and they capture it on this CD with another classic from their newest release. There is a nice mandolin solo from Lifeson and if you like the album version, you’ll love this live rendition. If I had to choose a favorite from Snakes & Arrows, this would be it. The lyrics and music fit perfectly with the entire Rush canon of music. On this CD, the track takes on a rawer sound and although I think the studio version is perfect, this is just as good and carries over well to the live setting. This track is one of the better tunes on the latest disc but here it kind of falls flat. I don’t know if it is too much all in a row but it gets lost when thrown in with all of the Snakes & Arrows material. It might have more of an impact if it was put elsewhere in the set. Lee announces that this is one of their favorites and I like this blues-tinged track but I don’t think it cuts it live. I said the same thing when I reviewed the concert and I’m sticking to it. I like it enough as a song but it does not have the same power as many of the other cuts. This tune goes back and forth in the set list yet whenever it is played; it is always a crowd favorite. It is played just like the studio version. There;s not much to say about it other than the vocals being a little lower but musically, it is just as it was originally recorded. I have said this before, on these last couple of tours, Lee sings the same verse twice (the one right after the intro). I thought I was loosing my mind but I pulled out Permanent Waves to hear the original version and I was right, he sings it twice. Other than that (and I don’t know why they decided to do that now), it is just like the first version they thrust upon us in 1980. Even on the Moving Pictures tour, this song was never played. I was finally glad to have a live version of this classic. Lifeson adds in a nice guitar solo at the end of this piece which is the only differing factor from the original version. It would not be a Rush show without some instrumental pieces and Peart’s drum solo. Here we get another one from the Snakes & Arrows record that is a bit more proggy than “The Main Monkey Business," It rocks out a little harder also. Peart’s drum solo is similar to the one on Rush In Rio. He has incorporated big band elements into the end of it that really exposes us to this type of music. I enjoy it even though I don’t consider myself a fan of that sound. Lifeson gets a small solo spot with this acoustic instrumental from the latest CD. It is just like the studio version with all of its renaissance touches. Some of the older material has gotten heavier over the years and this is among the music to which that applies Grace Under Pressure was lacking guitar (in my opinion) and here we get to hear a version that sounds fuller. If you have ever read any of my reviews of Rush products, then you know my feelings on this track. It is played well on this CD but nothing can make me not want to skip this cut. If you’re a fan, you’ll like it. If you’re like me, it won’t make it onto your playlist anytime soon. Although this is another over-played song, I still find myself listening to it every time. This ended the second set and it is a great way to end the show. They play it very much like the studio version without much difference. Oh, and if you saw the companion DVD, they removed the South Park intro here. We get another tune from Vapor Trails and this version is the best one out there. They play it like their lives depends on it. The mix captures the subtleties that were lost on Rush In Rio and this version has an urgency that was not found on the original. This is a classic that has been absent from their set for way too long. Lee’s voice is not as high as it once was so they play this version down a couple of notches. Musically, it is a bit heavier than the version on Exit…Stage Left but I’m just happy to have another version of this oldie. Just to give Lee time to change out his bass (I know this from seeing this tour in person), Lifeson and Peart throw in a little instrumental piece for a few seconds. To close out the show (and this CD set), Rush play another instrumental that has been in their setlists for quite some time. It is played note perfect and it is just as good as every other copy you may have of it.